Google giving us deets about Play, but where's that Nexus 5? After all the recent hubbub about the Nexus 5's brief appearance on the Google Play site, it only makes sense that we should get some official news soon. 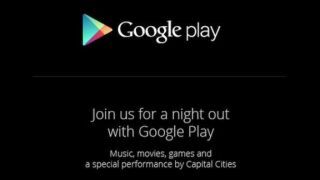 Which makes a Google Play New York City event slated for October 24 a strange coincidence, does it not? The "night out" invite briefly lists an array of activities including a special performance by Capital Cities. But sounds like the slumber party is missing one thing: a Nexus 5 announcement. A Google rep has confirmed with TechRadar that it's basically a meet and greet for consumer press to learn more about Google Play and that no news will be spilled. So it seems like there really won't be any info about the Nexus 5, and that the event might just focus on Google Play's new look - though we'll keep an eye out just in case, and wait for the imminent Android 4.4 KitKat launch. These blips won't toy with your emotions.